Keyword research is one of the most important tasks of any SEO campaign… it also happens to be one of my favorite tasks so I’m excited to share my criteria for what makes a good keyword with you here. 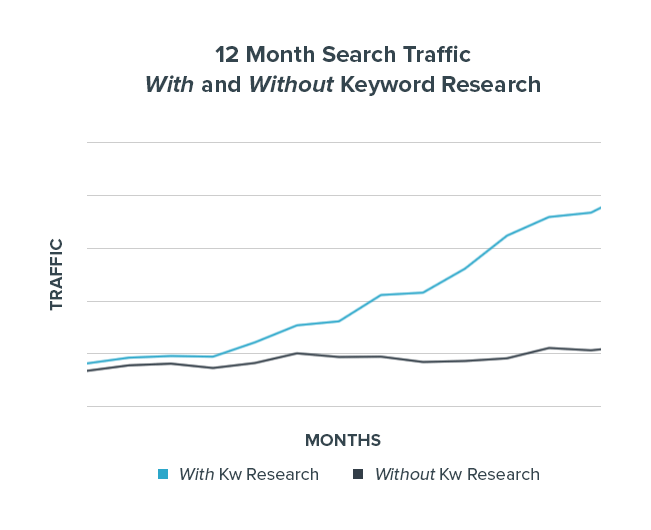 Whether you’re looking to drive traffic to your product or service pages, gain more exposure for your blog, or create and distribute a piece of content that positions you as a thought leader in your industry, keyword research can quite literally make or break the “success” of your efforts. I regularly come across businesses who have been producing content for YEARS with very little traffic growth to show for it. Like a lot of things in SEO, selecting keywords for your content is easy to over-complicate – but also easy to screw up! With countless (lengthy) articles, dozens of online tools, and enough crazy excel formulas to make your head spin, it’s no wonder why so many marketers give up before even getting started. Fortunately for you, my loyal reader, I’m going to simplify the process right now. What makes a good keyword? 1. Search Intent: it matches the intent of your content with the intent of the searcher, 2. Search Volume: it gets searched with enough frequency to drive meaningful traffic to your site, and 3. Competition: it’s a term in which you can realistically expect to rank. This is perhaps the most obvious, but also the easiest to overlook. Simply put, we want to make sure the intent of the searcher (and the search query they’re typing into search engines) matches the intent of the web page or piece of content we want them to find in search results. Are the results mostly commercial or informational in nature? If you’re researching keywords for a product or service page, and the results on page 1 are mostly informational in nature (e.g. blog posts, news sites, etc.) there is likely a mismatch of intent. Are there businesses similar to yours? Sometimes keywords may be relevant to more than one niche or industry, or simply have a different / more common meaning that you thought (embarrassing example of this to follow). Is your “keyword” actually the name of a business? You’d be surprised how often this happens. If it is, you’ll likely see the first 3 – 5 results taken up by their website and other online profiles, like LinkedIn, BBB.org, etc. Do the results contain multimedia such as PDFs or videos? If so, it likely means that search query is best addressed with that form of content, and as such, you should consider putting your content into the same format. In sum: If several of the results on page 1 are similar to what you’re working on, you’re likely in the right place! A couple years ago I was researching keywords for a public relations firm. One of their core service offerings is media training, where they coach C-level executives on how to develop and deliver messages effectively to the media. One of the keywords I found for them – which met the other two criteria in this post – was “media awareness training”. That intuitively made sense to me – meaning, it sounded exactly like what they offered so I went with it. After a couple months we were ranking on the top of page 1 for that term and I was pumped; however, no leads were coming in! So I fired up Google.com and searched the term to make sure their website was there. 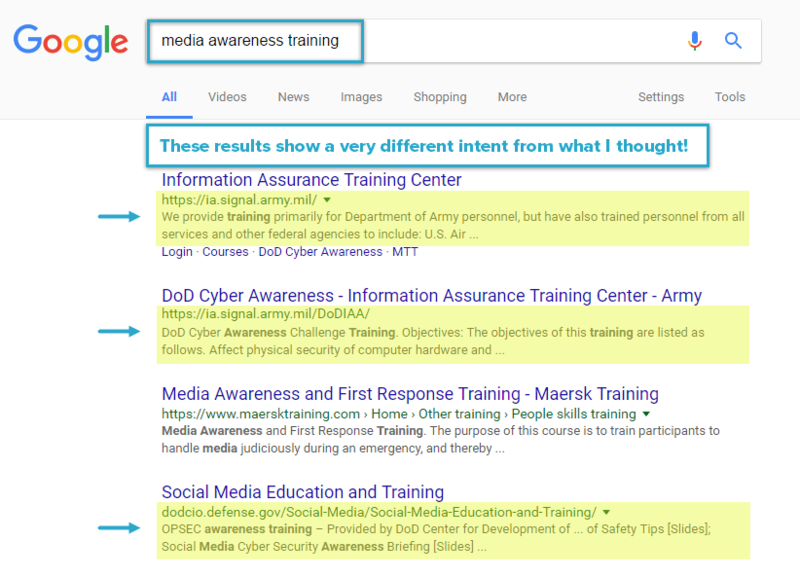 It was, but I noticed that the other search results were for a completely different type of training. It turns out that “media awareness training” is actually a type of training specific to military personnel – i.e. completely different from “media training” in the public relations industry. Luckily, we were able to swap out this keyword for a similar keyword, but with the correct intent. Within a few weeks they were off page 1 for the previous term and on page 1 for a much better term which led to multiple new business opportunities for them. BUT, I think this illustrates the reason why it’s so important to check the search intent of your keywords! So in order to get our products, services and information in front of people, we need to first understand the what and the how of their search habits so we can create the most relevant and valuable page for them to land on. This is where search volume comes into play. It refers to the frequency with which people are searching for a specific word or phrase, typically presented as a round number by month or “average monthly” over the course of a year. The numbers aren’t exact, but they can still be used as a rough approximation of how frequently a term is searched, as well as which terms are more commonly searched than others. What’s a “good” search volume? Well, there isn’t a magic number… and how much search volume to target depends entirely on your business, industry, geography, and type of content you’re doing research for. It can range from as little as 30 searches per month to tens of thousands of searches per month. How much traffic would a page and/or piece of content need to generate each month to have a meaningful impact on your business? A small dentist office in a suburb of Chicago. This business would presumably only serve people within a small geographical area – and, they don’t need thousands (or even hundreds) of new patients each month. As such, targeting keywords in the 30 – 100 searches/mo range would likely have a meaningful impact on their business. A B2B company offering high transaction services. This type of business would likely benefit more from longer, more targeted (i.e. 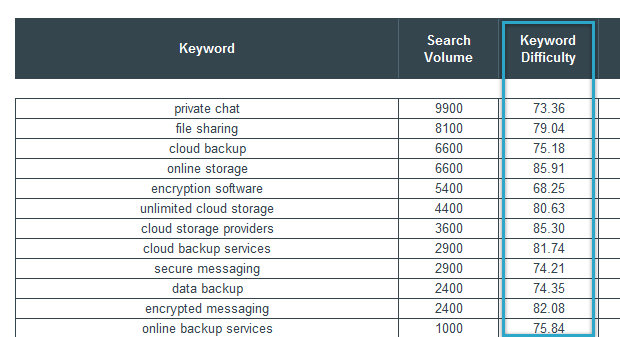 search intent) keywords with lower search volume vs. broader terms with higher search volume. For this business, even 2 – 3 new leads each month could be significant. A mid-size ecommerce business selling pet supplies. This business may have 10,000+ visits per month to their website already and rely on a much higher customer acquisition rate. As such, ranking for a keyword with 30 – 100 searches/mo wouldn’t make a dent, so they’d want to target keywords in the 100 – 1,000 range or more if it’s for their homepage or other key product/service page. A nationally recognized consumer clothing brand. This business may be receiving 100,000+ visits per month to their website, and similar to the pet supply business, rely on a higher customer acquisition rate. Their target market is also much larger than the other three examples and as such, they might be looking at keywords with 1000+ searches/mo. If the search intent of a keyword is off, you’ll either never rank for it – or if you do, it will result in un-targeted, irrelevant traffic to your site. If the first page of results is too competitive, you won’t break onto the first page either. This refers to how competitive the first page of search results is for a given term, and is probably the trickiest criteria to determine. In the SEO world, your “competition” refers to any web page ranking on the first page of search results for a keyword you want to rank for. While there is often overlap with your real world competitors – meaning, you will likely come across some of them in search results when researching words and phrases you want to rank for – this process will undoubtedly uncover new competitors for you. How do we determine keyword competition? This refers to the “strength” of a website in the eyes of search engines based on link metrics (i.e. the quality and quantity of other websites linking to them). Add the MozBar (free!) to your web browser. Turn it on and type your keyword into Google. Review the Domain Authority (DA) of the results on page 1. Ideally the DA of your website is higher than at least a few of the results on page 1 (you can check your DA here). If you’re below that range, the keyword may be too competitive for you; however, it’s still worth evaluating the next 2 criteria before ditching it. This refers to the blue “headline” that appears for each web page in search results. Search for a keyword you’d like to analyze. Scan the Title Tags for the top results. 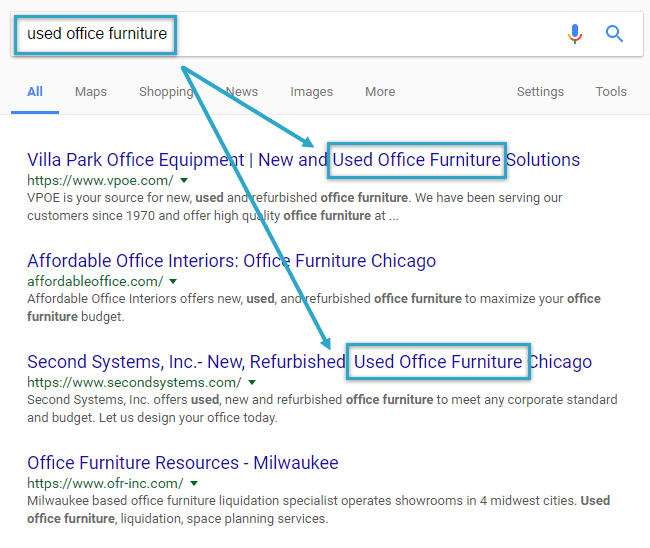 If your keyword appears verbatim near the beginning of many of them, it means these pages are likely very relevant and well-optimized for that term and will be more difficult to outrank. This refers to the overall “usefulness” of a web page in answering a user’s search query. Click on a few of the top ranking pages. Consider the following: Is the content well-written? Does it fully cover the keyword topic and/or satisfy a user’s search query? Are there multiple forms of content on the page (e.g. images, videos, charts/graphs)? Does the keyword appear verbatim multiple times on the page? Answering “yes” to three or more of these questions means there are already well-written/optimized pages for that keyword topic and they will be more difficult to outrank. In determining how competitive a keyword is, you should consider all three of these variables together, which is where the “art” part comes in. This is something you’ll get a better and better “sense” for after going through the process many times. 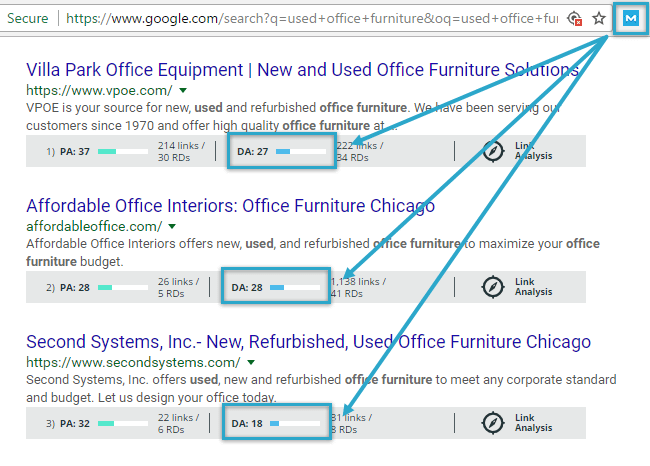 The last thing I want to (quickly) discuss here is the use of tools to expedite the keyword research process, particularly for larger projects. 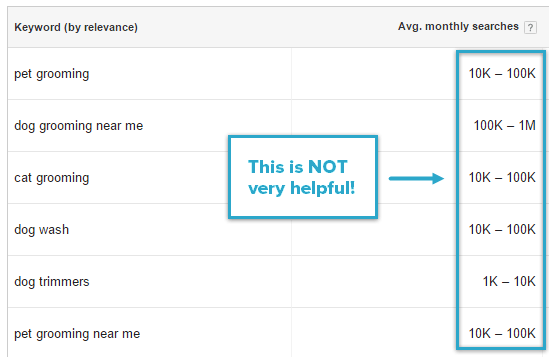 Google Keyword Planner was the free, go-to keyword research tool for advertisers and marketers for as long as I’ve been in the business (10+ years)… but around August of 2016 they decided to restrict their data from free users, making it available only to high-spending AdWords customers. This was a massive blow to the people that have relied on it for keyword ideas and search volume data for years (like me), but life goes on! Unfortunately, most of the “free” tools still available are very poor – at least until you upgrade to a paid account. As such, if SEO is an important part of your business, I highly recommend testing a paid tool to conduct your research with. The data they provide and time they save is well worth the $50 – $100 per month they cost. Most of the “name-brand” paid keyword research tools you come across will work just fine for generating ideas and providing search volume estimates. That said, the one I personally use is SEMrush. I’m going to write a more detailed post on how to use SEMrush for keyword research soon, but for now I’ll just say that I find it to be the simplest to work with – and, a paid membership gives me access to their entire suite of tools (which are awesome). 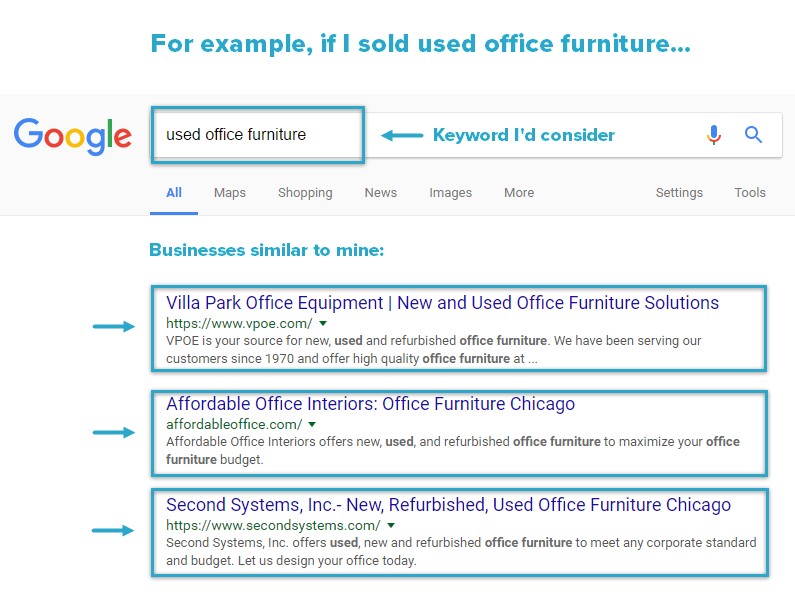 While I think that going through the more manual process explained in this post is the best / most accurate method for determining keyword competition, it may not be feasible to do this for hundreds or thousands of keywords (for instance, if you’re doing research for an entire site). 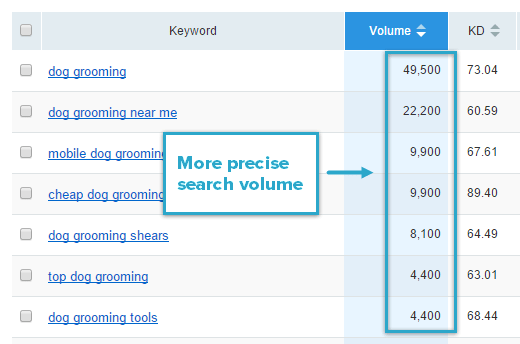 There are a handful of really great keyword research tools out there that provide a competition or “difficulty” score where you simply type in a keyword (or upload a list) and they’ll quickly spit out a number for each. So for larger projects I’ll combine and organize my list of keyword ideas in excel, then add a column for “Keyword Difficulty” where I’ll input adifficulty score from a paid tool. I still do a lot of manual checking as I start narrowing down my top keyword choices, but this is a good way to get a high level idea of the competitiveness of the terms I’m considering. SEMrush: provides a simple ‘Difficulty Score’ displayed as a percent (1 – 100) based on the strength of the domains currently ranking in the top 20 positions for the keyword. Moz: their new keyword research tool, Keyword Explorer, provides a very similar ‘Difficulty Score’ as SEMrush; however, I find their score to be slightly better / more accurate in predicting the competitiveness of each term. This post went on a little longer than I anticipated, but I hope my criteria for determining what makes a good keyword was helpful. As I mentioned at the beginning of this post, the difference between sites that create pages and content based on good keyword research and sites that don’t can be massive. Further, all future SEO efforts will have a faster and more significant impact on your site and business with well-researched keywords in place. If you have any questions or feel I missed something important, please feel free to let me know in the comments section below. I appreciate you reading and hope to see you again soon! Join a bunch of reeeally smart marketers who receive monthly SEO tips.